JEDDAH: Gulf Arab states grappling with lower oil revenues yesterday formed a new agency to tighten economic cooperation in the region. The Economic and Development Affairs Authority “will boost coherence, integration and coordination between member states in all economic and development sectors”, the Gulf Cooperation Council said in a statement after a summit in Jeddah. The GCC was founded in 1981 to more deeply integrate the Gulf countries, but analysts say progress has been slow. The collapse of global oil prices has forced the Gulf monarchies to make unprecedented fuel and energy subsidy cuts and plan to introduce indirect taxation. They have also scaled back spending on large projects. Oil prices have fallen from more than $100 a barrel in early 2014 to around half that level. The newly formed body “will look into matters such as completing the customs union and the common market of the GCC states,” Saudi Foreign Minister Adel Al-Jubeir told a news conference after the summit. He said the authority “can solve these issues urgently and effectively” to promote cooperation. US President Barack Obama said after a summit with the GCC in Riyadh last month that the six-nation council will establish a “high-level economic dialogue” with the United States. It will “focus on adjusting to lower oil prices, increasing our economic ties and supporting GCC reforms,” Obama said. 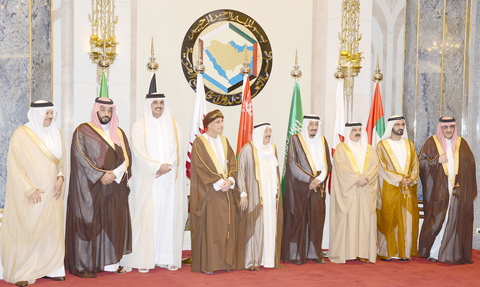 Meanwhile, GCC leaders commended efforts exerted by HH the Amir Sheikh Sabah Al-Ahmad Al-Jaber Al-Sabah aiming to render the success of the current peace talks among the Yemeni warring parties in Kuwait, said GCC Secretary General Abullatif Al-Zayani. Zayani made the statement during the joint news conference with Jubeir. Jubeir said the Yemeni peace negotiations are currently held in accordance with the implementation of outcomes of national dialogue, the UN Security Council resolutions, the Gulf initiative, the ceasefire, handover of weapons and the restoration of legitimacy.